On Friday, Chipotle announced they’d soon be offering sick days, paid vacation, and tuition reimbursement for all employees—not just salaried workers. According to Nation’s Restaurant News, the new programs will begin July 1. While Chipotle has long offered these benefits to salaried employees, this is an interesting step towards treating fast food workers like actual human beings. Then again, Chipotle has recently shown a keen (and somewhat unique within the industry) awareness for which way the wind of public opinion is blowing, even when that public opinion is blowing due Stupid. McDonald’s moved somewhat in this direction earlier this year in allowing workers to accrue vacation time, but a) the employees had to have been with the company for a year to start racking it up, and more importantly, b) it only applied to non-franchise locations (corporate stores make up only a fraction of the total number of McDonald’s locations). 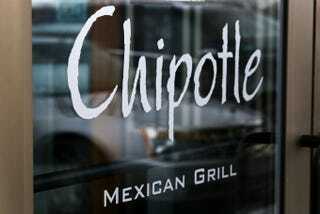 Chipotle, fairly unusually within the industry, does not franchise. It’s unclear what form the tuition reimbursement will take, as specific terms are yet to be announced. Starbucks has a similar program limited to those working at least 20 hours a week, and it’s probably reasonable to assume Chipotle’s deal will be function along the same lines. Starbucks, however, only extends this offer 49 different degree programs from Arizona State University; it would be interesting if Chipotle’s deal was somewhat less limiting. Regardless, the sick days and paid vacation are a significant deal. Though Chipotle has always shown more of an interest in employee retention than many of its competitors (by their own metrics, 95% of all managers are promoted from within), much of their talk of treating their employees well has been more buzzword than actual fact. In moving to allow part-time hourly employees to accrue sick days and paid leave, they appear to be taking a tangible step in the direction of actually backing up their talk.